14 5/8 x 22 1/2 in. 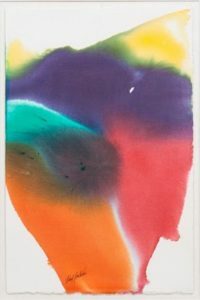 As a member of the Abstract Expressionist movement, Paul Jenkins was renowned for his technique of controlled paint pouring and use of translucent colors. He came of age during the heyday of the New York School and was deeply influenced by his interest in Eastern religions and philosophy, the writings of Carl Gustav Jung, and Goethe’s color theories. These influences, prompted him to turn toward inward reflection and mysticism, which dominated both his aesthetic and personal life. The artist had studios and homes in New York City and in France (both Paris and St Paul de Vence), in which he displayed a vast collection of decorative items that he gathered for their mystical powers. This week’s Work of the Week! WOW! is Celestial Wink. Celestial Wink is a beautiful example of Jenkins’ work in watercolor. The work features every color in the rainbow with a strong balance of motion and blending. His colors seem to be moving, misty or fully liquid, billowing, surging, flaring, breaking up, capturing the semblance of shifts in direction. The composition as a whole confirms that the paint application was not left up to chance. There is a perfect amount of negative space (the white background), at angles that follow the strokes of color, allowing the work to flow harmoniously. Jenkins also had a process when finding titles for his creations. “I try to find the identity word that will secure an attitude toward a painting rather than provoke a visual object that the eye will seek out.” The title Celestial Wink speaks to this attitude, just like the occurrence of a rainbow, only visible through reflection of water droplets directly opposite the sun, it is an ephemeral phenomenon, only possible under certain conditions. The title also echoes back to Jenkins’ interest in mysticism and suggests a surrender to the spiritual or outer-worldly. Celestial Wink does seem like a force of nature. This entry was posted in WOW! and tagged americanart, art, artgallery, CelestialWink, fineart, gallery, greggshienbaum, greggshienbaumfineart, gsfineart, gsfineartmiami, Jenkins, PaulJenkins, prints, workoftheweek, WOW!, wynwood, wynwoodmiami by admin. Bookmark the permalink.